Chemical Weapons Inspectors Finish Their Trip To Syria's Douma : The Two-Way Investigators finished gathering samples from the town where a suspected chemical weapons attack occurred. The team suffered a few delays and Russia "may have tampered" with the site. 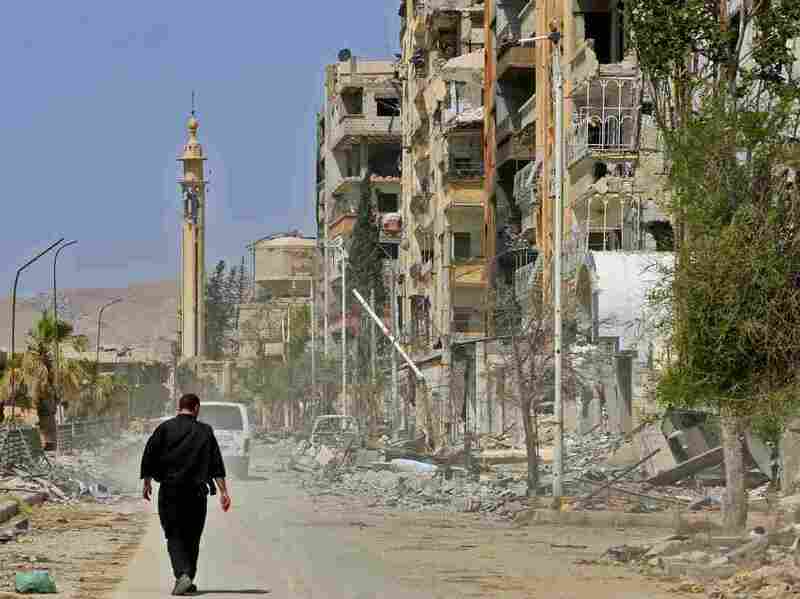 A man walks down a street in war-torn Douma on April 20, days after the suspected chemical attack. The Organization for the Prohibition of Chemical Weapons said Friday that its team of investigators has finished a fact-finding mission in the Syrian town of Douma, where a suspected chemical weapons attack took place in April. The inspectors brought back samples to the OPCW laboratory in Rijswik, near The Hague. Those samples will be sent to secret laboratories — the OCPW does not disclose which facilities it works with — and the analysis could take at least four weeks, the international chemical weapons watchdog said in a statement. The international team arrived in Douma on April 21 – two weeks after more than 40 people died and hundreds of others were injured in what U.S. authorities say was a bombardment of chlorine and possibly a nerve agent such as sarin. Doctors in Syria and local activists described to NPR what they witnessed the day of the suspected attack. "I saw the victims, and I saw them foaming at the mouth," a Syrian photographer told NPR's Ruth Sherlock. "My children started to turn blue so we tried to go upstairs to get some air, and then the bombs were shelling us. So we had to go back downstairs," a 19-year-old told NPR, adding that it was "as if it was a barrel of chlorine just spilled everywhere." President Trump and Western allies have blamed Assad's government for the deaths, which occurred in an area formally held by rebels. Syria and its ally, Russia, which now control that region, deny those allegations. Three days after the attack, on April 10, Syria and Russia asked OPCW to investigate the allegations. The experts arrived in Damascus on April 14 but suffered multiple setbacks in reaching Douma. Syrian and Russian officials blocked them from entering the town because they didn't have the right U.N. permissions. What transpired in those days worried Kenneth Ward, the U.S. representative to the OPCW. He said that Russia "may have tampered" with the site "with the intent of thwarting the efforts of the OPCW Fact-Finding Mission to conduct an effective investigation." Russia denied intruding and later held a briefing at OPCW headquarters contending that the incident was staged with "unwitting comedians." The team was slowed down again when a U.N. security team entered Douma before the OPCW and came under small arms fire in addition to an explosive device, said the watchdog. The delays may make evidence of a chemical attack harder to trace. As investigators waited in Damascus, people from Douma were brought to the capital to be interviewed. Some 100 environmental samples were eventually collected, OPCW Director-General Ahmet Uzumcu told The Financial Times. He also hoped the OPCW could exhume the bodies of people who died so that experts could collect biomedical samples. It would be the first time that the organization exhumed remains, he said. Now that much of the evidence has been collected, the OPCW would not say when it would release a report. "At this time, it is not possible to give a timeframe for when the Douma report will be issued to States Parties to the Chemical Weapons Convention," the organization said. The inspectors will determine what substances were used in the suspected attack, but not who used them. That task falls outside of their mandate.